Do you have an idea / concept for a business you want to pursue? The first step is to define exactly what you want to achieve and how you will make it happen. This is done through what is commonly referred to as a Vision Statement … and is often supported in formal Business Plans by what is called a Mission Statement. These two statements define the “big picture” behind your subsequent actions. Of course, you can always combine the two into ONE statement which can be called either a Vision or Mission Statement. This is your choice! To assist individuals and business owners establish a solid foundation for success through tried and proven “income growth” training, tools, and services. This incorporates the time proven adage that, to succeed in any venture, you MUST help others achieve / get what they want whether that is better health, a great dining experience, a new job, making more money, a great deal, etc. A Mission Statement like the above is something people can relate to and our presentation on this website is aligned to this. A Vision Statement needs to explain / define “what you want to become / achieve”. This is your big picture so it needs to be very clear. To provide a simple PLATFORM which gives individuals and company’s access to tried and proven “income growth” training, tools, and services PLUS the ability to also help others achieve success in their business and lives. Aside from in this article, we do not publish our Vision Statement on our website, preferring to state only our Mission Statement so as to not confuse visitors. You can always publish both if you wish. 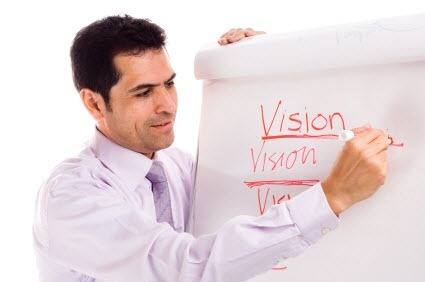 Having a clear vision statement will help you stay on track. It describes where we want to be – i.e. we see ourselves as a service provider rather than a marketer- and this mindset underlines how we approach things. It also defines how we want to reach out to individuals and companies – i.e. by working with other groups. Whilst training is a key part of our overall “platform”, it is only the start which is why our primary products include what most training lack – i.e. access to our Affiliate Program so buyers have a simple and practical way to TAKE ACTION in helping others … and of course to get rewarded for doing so. A simple yet solid, transparent, informative website which has a strong sharing focus and avoids hard sell so Distributors (and Affiliates) can refer others to us with confidence. No Name capture – no popups for building a list at referrers expense. Yes, we do invite subscriptions via our Free Reports but have done so in a way whereby subscribers referred by our Affiliates are locked into them and so will benefit from any subsequent action. Assurance of delivery as we control – or manage – the majority of products and services on this website. Flexibility – to do business online and /or offline. The above apply to our business. You will need your own “points of difference” in order to make your Vision attainable. You can always change your “how to” (Mission Statement) in accordance with market requirements to help you get to “where you want to be” (Your Vision). Of course, you can also change your Vision as well although, if the change is dramatic and you already have a presence in the market, you may need to consider doing so under a different umbrella / company in order to avoid confusion among your existing clients. The over-riding consideration on whatever changes you make is to do so in a direction you believe in / have a passion for. Most importantly, make sure your VISION (big picture) is realistic!